A 4 year old presents with parents to the emergency department complaining of immense stinging pain to the arm with a new rash shown above. The child was playing out in the backyard and thinks something may have bit him. What is your diagnosis? This patient presented with these markings accompanied by a burning and itching sensation. 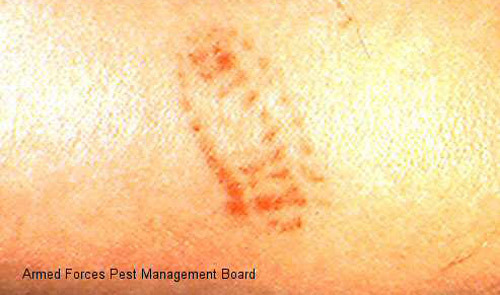 This reaction was caused by cutaneous envenomation by a poisonous species of caterpillars. The most likely culprit that displays this pattern of markings is the Flannel Moth, or more precisely its larvae, the Puss caterpillar (Megalopyge opercularis). Other names include the asp, wooly asp, Italian asp, opossum bug, wooly slug, and el perrito. It is considered the most toxic caterpillar in North America. Notice the hairs along the underside of the puss caterpillar in the pictures above. When these rubs against a victim, these hairs break off and embed in the underlying skin causing severe pain and a hemorrhagic rash. This little guy is predominately present in the southeast US, predominately in Texas but spreads as far East as Florida and as far North as Virginia. It has a bimodal peak yearly in both Spring/early Summer and Fall. They are present largely in shaded areas in trees or shrubbery and often can be found around homes, parks and schools. "It felt as though my arm had been broken." "It immediately felt like a hammer hit me." "I have had kidney stones before but I believe the pain I am experiencing from the asp sting is worse." Within an hour of envenomation, a clear pattern of hemorrhagic papules will usually arise in the area affected, usually lasting for several days; lymphadenopathy and swelling may also develop. Other symptoms may include headache, nausea, vomiting, intense abdominal pain, and sometimes shock or respiratory distress. Patient's are also noted to experience panic attacks since they often do not know what is causing their symptoms. 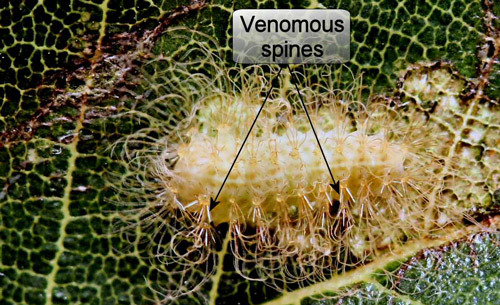 There is no anti-venom for pus caterpillar envenomation. One strategy suggested describes applying tape to the site and pulling it off to remove the hairs ("stripping"). Other patient home remedies have included applying ice packs, oral antihistamines, baking soda, hydrocortisone cream or calamine lotion. Other papers suggest pain relief through intravenous calcium gluconate or systemic corticosteroids. There is not good evidence for any of these treatments though the "stripping" seems to be reasonable if the patient presents in a timely manner. Once important aspect may be to recognize the envenomation pattern and correlate with symptoms to prevent unnecessary panic and work up. 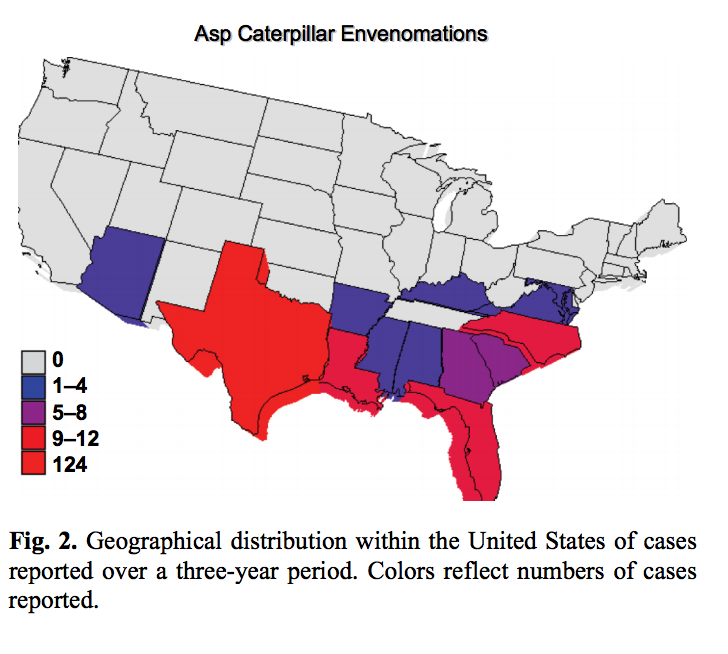 I recommend reading the reviewed article on pus caterpillar envenomation here as it is not only educational, but also quite entertaining. Eagleman D. Envenomation by the asp caterpillar. Clinical Toxicology (2007) iFirst, 1-5. Donald W. Hall. "Puss Caterpillar." entnemdept.ufl.edu. University of Florida, March 2013. Web. 16 November 2014.